As the years pass and we move further from les années noires of the Occupation an honest and non-judgemental discussion of what happened, and why, becomes easier. But this has not always been the case. While de Gaulle worked hard to remind the world that France had been the country of ‘La Résistance’, other voices wanted to discuss those who had been collaborators. Sometimes it was difficult to distinguish one from the other and of course the vast majority of the population had just kept their heads down uncertain whether they would ever be liberated. French Cinema’s relationship to this debate is fascinating. 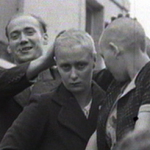 Some films were cheerleading for an image of France united in opposition to the Nazis, others were provoking discomfort by exposing truths that were difficult to swallow. The first surprise to many was that French cinema survived the occupation in such good shape. In 1944 André Bazin, no friend of Marshal Pétain (the French leader during the occupation), said: "It is even possible to believe that the health and probably the quality of our production has remained sound in spite of terrible economic and technical conditions. French cinema is putting up an almost miraculous fight with a vitality and energy that may surprise historians". During the war cinemas provided relief from the grim day-to-day. In 1943 there were 304 million cinema visits almost 30% up on pre-war figures. In addition, amidst a lot of dross, some eminent directors continued to produce films of high quality, Marcel Carné’s Les Enfants du Paradis for instance and others geniuses cut their teeth, Henri-George Clouzot with Le Corbeau, or Robert Bresson with Les Dames du Bois de Boulogne. But once the war was over the problems of how to represent what had happened began. La Bataille du Rail by René Clément presented no issues in 1946. It was an heroic and accurate story of how the French railway workers had thwarted the Nazis during the war and been especially effective in preventing the deployment of reinforcements for D-Day. Any discussion of the grim reality of the black market, anonymous letters of denunciation or the part the French authorities had played in the deportations to the concentrations camps was absent. Attempts to open the debate were met with cold shoulders. When Marcel Carné set his first post-war film Les Portes de la Nuit in contemporary Paris and included characters whose war had been none too clean his film crashed. People needed light relief not to be reminded of the horrors they had experienced. During the '50s, France was too busy re-building itself to engage in much recriminatory debate and cinema largely reflected this. One remarkable exception was Nuit et Brouillard made by Alain Resnais in 1955, a documentary about how the French had fed many of its citizens into the concentration camps, it used archive footage, location filming, and a haunting but balanced voice-over to explain what Resnais saw had happened. Many praised Resnais for his bravery and artistry but others called for the film to be banned. The French government insisted on censorship and insisted that, for instance, some technical sleight of hand be employed to obscure the French uniform in one scene lest it upset the French Army. There were even attempts to ban its screening at the Cannes Festival. A lot of people wanted to forget the war and move on. For me the next key milestones in the development of the way we regard the occupation came in the '70s. Firstly Marcel Ophuls, Le Chagrin et la Pitié (The Sorrow and the Pity) 1971, using direct interview techniques that were relatively new made an epic documentary about what life had been like in occupied Clermont-Ferrand. He interviewed members of the resistance, collaborators and even German soldiers who had been stationed there. It was extraordinary but too strong for French TV who had commissioned it and was for many years restricted to cinema showings in France. The fiction equivalent was Louis Malle’s Lacombe Lucien in 1973. Like most filmmakers of his generation he had very clear memories of the war and in the face of what he felt was an increasing inclination to forget some of the hard truths he decided to show a version of the occupation from the point of view of a young man who, spurned by the local resistance, joins the other side. This was a major film by a major filmmaker and the response split France. For many it was just too ambiguous but this is what Malle had intended having seen such behaviour himself more recently in Algeria. The reluctance to conffont some of the unpalatable facts continued with fire bombings of cinemas that showed André Halimi’s Chantons sous l’Occupation in 1976 a documentary showing how Paris remained open as the ‘entertainment capital of the world’ despite, or rather because of, the new business the war brought. As personal memories and enmities began to fade the representation of the war years became, with the odd exception, progressively more balanced. Two spring to mind and both as a result of the 1983 indictment and subsequent trial of Klaus Barbie accused of crimes while head of the Gestapo in Lyon. Not known for his documentary making Claude Chabrol, angered at the hand-wringing that was going on over whether Barbie was a victim of history, released L'Œil de Vichy (The Eye of Vichy) in which he stitched together Vichy propaganda films which reminded people just how vehement the anti-semitism and other excesses of Pétain’s regime had been. The second film to remind audiences of how divided France had been was Claude Berri’s Lucie Aubrac in 1997 but in this case it reminded audiences that the French Resistance had not been exclusively male! People will have their own favourites but here are a few of mine, Jacques Audiard’s Un Héro très discret (A self-made hero) where the lead character decides to join the resistance only after the war is safely over, and Robert Guédiguian’s 2009 Armée du crime (Army of crime) that revealed the largely forgotten work of a resistance cell consisting of foreigners. This was a terrible but fascinating period in French history and one it really bears investigating. Which are your favourites and why? If you would like to know more Jon Davies is holding four Sunday afternoons at the Cinema Museum looking at the way the Occupation was portrayed on screen. More info here.